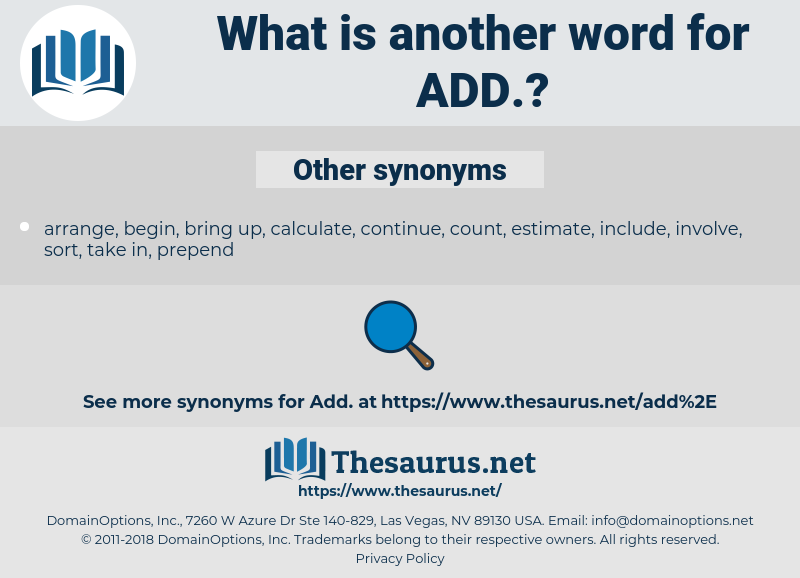 What is another word for add? make an addition by combining numbers; " Add 27 and 49, please!" Indicated, said, Provided, Grew, used, Got, Inserted. 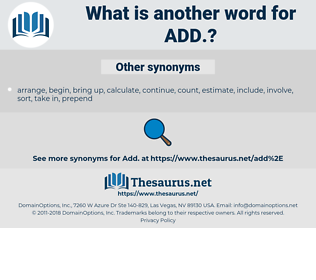 complementing, Appending, expanding, Introducing, contributing, Enlarging, augmenting, saying, writing, affecting, Boosting, Noting, building, compounding, Gaining, putting, Inserting. exacerbated, complemented, Appended, aggravated, accompanied, Dragged, combined, multiplied, Supplemented, said, embedded, Aggregated, Boosted, coupled, pointed, placed, compounded, remembered, grown, backed, risen, Inserted. are, AM, say, contribute, aggravate. augment, exacerbate, correspond, say, contribute, aggravate, introduce, amplify, replenish, inscribe, inject, enlarge, broaden, complete, emphasise. guess, estimate, withdraw, reduce, diminish, lessen, deduct. condense, abstract, retrench, amputate, contract, constrict, sever, excise, lower, unfasten, disjoin, compress, dissever, remove, lop, decrease, bate, disconnect, cut. For market I prefer Winesap, Missouri Pippin, Ben Davis, and Jonathan, and for family orchard would add Maiden's Blush.
" Add four," said Ann, " and you'll be nearer it." audio, adhd, ate, ao dai, aditya, adh, aoudad, aide, ado, ada, a.d., auto, aditi, aided, ahead, await, adit, ade, at, aid, adad, audit, ad, awaited, attitude, audad, ahuehuete, athodyd, add to, awed, aythya, adieu. string up, supplement, modify, butylate, punctuate, include, inject, put on, welt, button, enrich, concatenate, mix, work in, stud, adjoin, compound, mark, intercalate, string, paint the lily, fortify, gild the lily, add on, combine, milk, qualify, mix in. stick in, sneak in, insert, toss in, slip in.